We offer a range of outdoor activities and exciting new ways to see the Welsh countryside for all ages and abilities. We are located in the beautiful Taff Valley just outside Cardiff. Experience the thrill and challenge of Quad Biking, negotiating a 250cc or 90cc Honda all-terrain vehicle, with a trek through our cross-country nature trail whilst enjoying some of the best views of the Taff and Rhymney Valley’s in South Wales. Our farm is 340 acres of hills, fields, bumpy tracks, woodlands and streams - perfect Quad Biking terrain! Alternatively why not try one of our other activities. Action packed day of Gorge Walking in the Brecon Beacons, prepare to get wet! 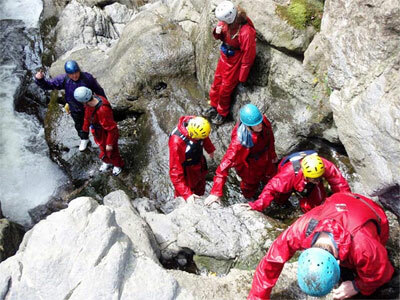 Taff Valley can also arrange packages for corporate team building, youth group activity days or residentials and hen and stag weekends. We run two courses designed for young people which incorporate quad biking, and other activities; OCN Accredited ATV Safe Driving and Maintenance Course and a 3 Day Citizenship Course. We have also grown another side of our business over the last 4 years and we now link with most accomodation and activity providers in South Wales to offer fun filled activity days and activity breaks. Mix and match activities in the area and stay in the best places! We also link with transport providers and meal options. We specialise in stag and hen weekends, corporate and conferencing events, youth groups and residentials, sports tours and breaks for couples and families are also easily arranged. Let our expert local knowledge and contacts take all the hassle out of arranging an activity break or event. There is no event too big or too small for our team to arrange; with options to suit every corporate event, any number of people and most importantly every budget! We link with lots of different venues nearby to provide meeting rooms and conferences, with or without teambuilding activities. Many companies are choosing to expand their conferences by adding teambuilding activities, making unique and memorable days for their staff. They can also act as an incentive to ensure good attendance to the meeting/conference. Small budgets can be catered for very well. Businesses with only a small number of employees can find the cost of hiring venues expensive, but we have some good affordable options. We have options for larger companies and have catered for 120 people. We are open all year round, come rain or shine! All activities need to be booked in advance. Bookings can be made by calling (029) 20 831658. Activity Gift Vouchers Available Now!